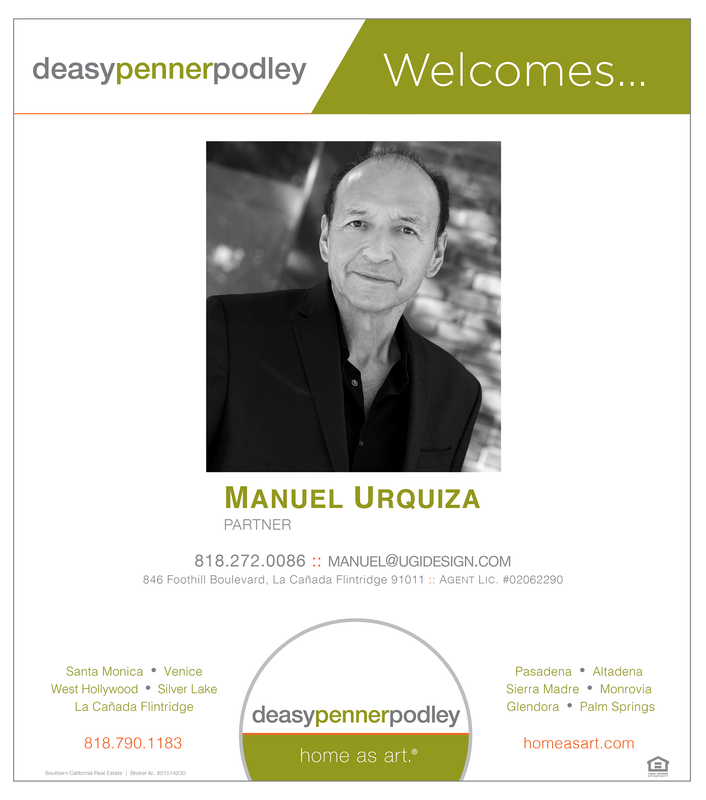 deasypennerpodley is excited to announce Manuel Urquiza as a new agent to our La Cañada family. My professional life for the past 25 years has largely revolved around my passion for great architecture and design. Great architecture begins with the thoughtful siting of a building, avoiding indiscriminate placement with no regard for the existing environment. Good design is about the feeling you’re struck with when entering a new space. A realtor’s job begins with understanding of their client’s expectations and financial goals. I gain my clients’ trust through a practice of “no sales pitches.” I’m mindful of what’s important to them, and work to build a fiduciary relationship that protects their interests and achieves their goals. My expertise lies in my ability to communicate today’s economic conditions, financing outlook, and housing market, all of which is amplified by my deep understanding of architecture and design. I can evaluate the quality of properties, and the functional integrity from an architectural perspective. Perhaps most importantly, I am able identify improvements and upgrades that will elevate your home above others in a similar price range. My current focus is on corporate clients, multi-unit projects, and investment properties. With my comprehensive knowledge of financing strategies, cash flow returns, construction and permanent loans, I’m well positioned to help my development and investment clients realize their project goals. deasypennerpodley is a design-centric real estate brokerage selling architectural, historic, and luxury homes. They share my values of architecture and design, and have a proven record of successfully representing multi-family, mixed use, conversion, and small lot subdivision projects. My hobbies include coaching soccer and basketball. I am an ardent backpacker, having climbed throughout the Sierra Nevadas. As an equestrian I’ve ridden competitively, both dressage and jumpers. Born and raised in Los Angeles, I’ve practiced architecture across the United States. My architectural firm and my corporate projects have received numerous design awards and have garnered considerable returns for their investors.